Derivatives are defined as the type of security in which the price of the security depends/is derived from the price of the underlying asset. The most common underlying assets include stocks, bonds, commodities, currencies, interest rates and market indexes. 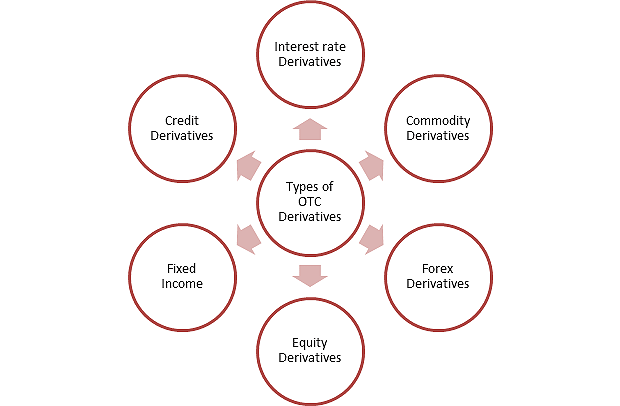 The common types of derivatives include Options, Futures, Forwards, Warrants and Swaps. 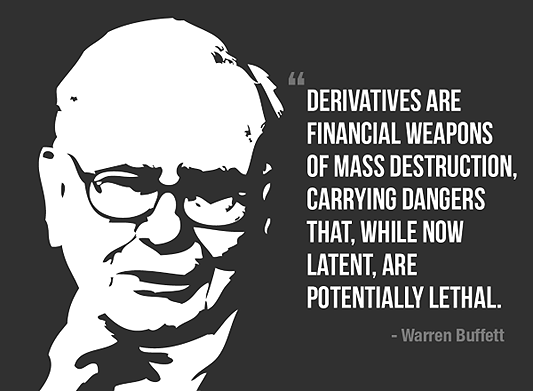 Derivatives allow users to meet the demand for cost-effective protection against risks associated with movement in the prices of the underlying. In other words, users of derivatives can hedge against fluctuations in exchange and interest rates, equity and commodity prices, as well as creditworthiness. Participants in derivatives markets are often classified as either “hedgers” or “speculators”. However, hedging and speculating are not the only motivations for trading derivatives. Some firms use derivatives to obtain better financing terms. Fund managers sometimes use derivatives to achieve specific asset allocation of their portfolios. Exchange traded derivatives (ETD) are traded through central exchange with publicly visible prices. Over the Counter (OTC) derivatives are traded between two parties (bilateral negotiation) without going through an exchange or any other intermediaries. OTC is the term used to refer stocks that trade via dealer network and not any centralized exchange. These are also known as unlisted stocks where the securities are traded by broker-dealers through direct negotiations. With different characteristics, the two types of markets complement each other in providing a trading platform to suit different business needs. On one hand, exchange-traded derivative markets have better price transparency as compared to OTC markets. Also, the counterparty risks are smaller in exchange-traded markets with all trades on exchanges being settled daily with the clearinghouse. On the other hand, the flexibility of OTC market means that they suit better for trades that do not have high order flow or special requirements. In this context, OTC market performs the role of an incubator for new financial products. Swaps are widely regarded as the first modern example of OTC financial derivatives. All OTC derivatives are negotiated between a dealer and the end user or between two dealers. Inter-dealer brokers (IDBs) also play an important role in OTC derivatives by helping dealers (and sometimes end users) identify willing counterparties and compare different bids and offers. Interest rate derivatives: The underlying asset is a standard interest rate. Examples of interest rate OTC derivatives include LIBOR, Swaps, US Treasury bills, Swaptions and FRAs. Commodity derivatives: The underlying are physical commodities like wheat or gold. E.g. forwards. Forex derivatives: The underlying is foreign exchange fluctuations. Fixed Income: The underlying are fixed income securities. Credit derivatives: It transfers the credit risk from one party to another without transferring the underlying. These can be funded or unfunded credit derivatives. e.g: Credit default swap (CDS), Credit linked notes (CLN). OTC markets have two dimensions to it, namely customer market and interdealer market. In customer market, bilateral trading happens between the dealers and customers. This is done through electronic messages which are called dealer-runs providing the prices for buying and selling the derivatives. On the other hand, in the interdealer market, dealers quote prices to one other to offset some of the risk in the trade. This is passed on to other dealers within fractions. This clearly provides a view point on the customer market. These derivatives offer companies more flexibility because, unlike the “standardised” exchange-traded products, they can be tailored to fit specific needs, such as the effects of a particular exchange rate or commodity price over a given period. Companies say such derivatives play a big part in helping them to provide consumers with stable prices. Interest rate risk: Companies prefer to take loans from banks at a fixed rate of interest in order to avoid the exposure to rising rates. This can be achieved through interest rate swap which locks the fixed rate for a term of loan. Currency Risk: Currency derivatives allow companies to manage risk by locking the exchange rate, beneficial for importer or exporter companies that face the risk of currency fluctuations. Commodity Price Risk: Financing in terms of expansion can only be available if the future selling price is locked. This price risk protection is provided through customized OTC derivative. e.g. Crude Oil producer would like to increase production in tandem to increase in the demand. The financing will be done only if the future selling price of the crude is locked. Lack of a clearing house or exchange, results in increased credit or default risk associated with each OTC contract. Speculative nature of the transactions causes market integrity issues. Although OTC Derivatives is a good tool for corporate, it does need more education to attract investors and be used on frequent basis.